Sorry it's been quiet here for the past couple of months but it's been a busy summer. I am now back and refreshed ready for this autumn/winter weather, seasonal food and all the holidays ahead. Are you ready for another quick and simple dish? 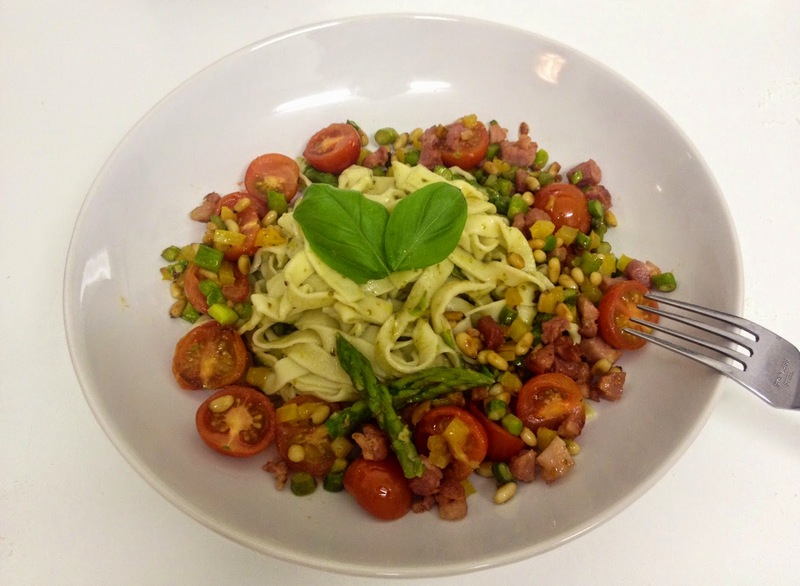 Now I just love pasta, it' such a great weeknight dish, so here is one of my favourites. 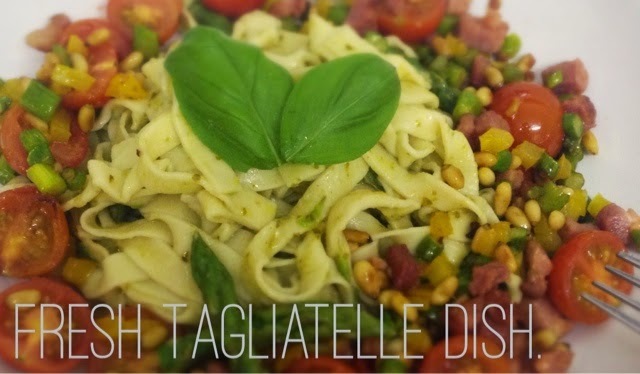 If you have a bit of extra time then follow the steps for homemade fresh pasta or if you are in a hurry then pick up your favourite pasta from the supermarket, mine is definitely tagliatelle! 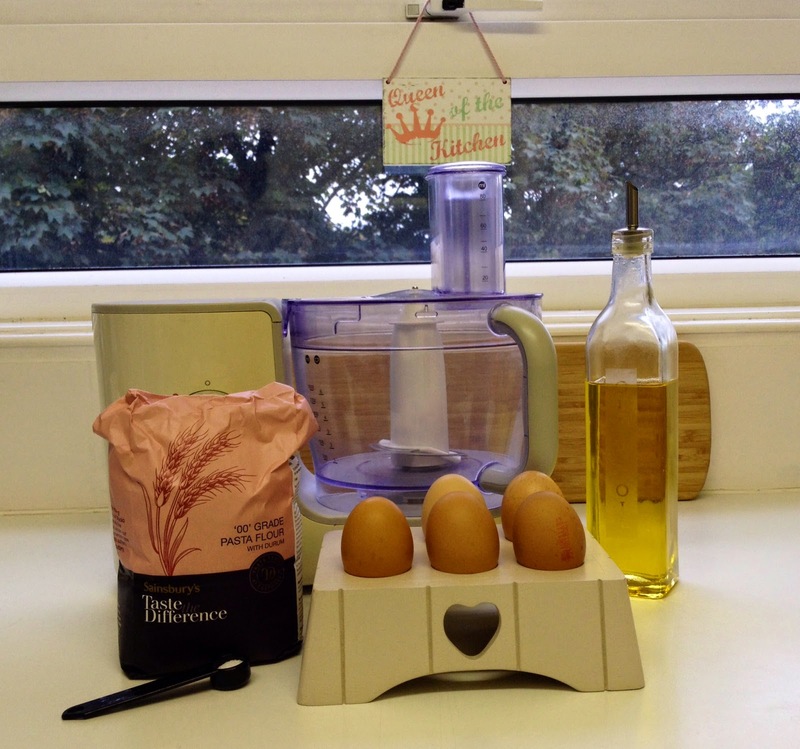 You can by all means do this all by hand but today I am going to be doing a much quicker, less messy method using a food processor. 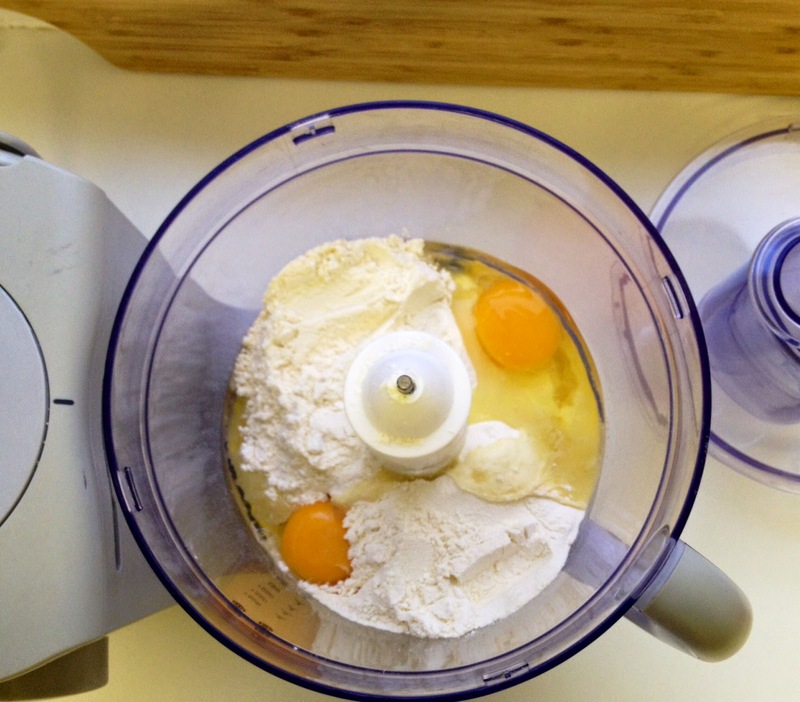 Add all ingredients and pulse a few times until the dough comes together and the mixer slows. If the dough is having trouble coming together, either because it's too wet or too dry just gradually add water or flour. 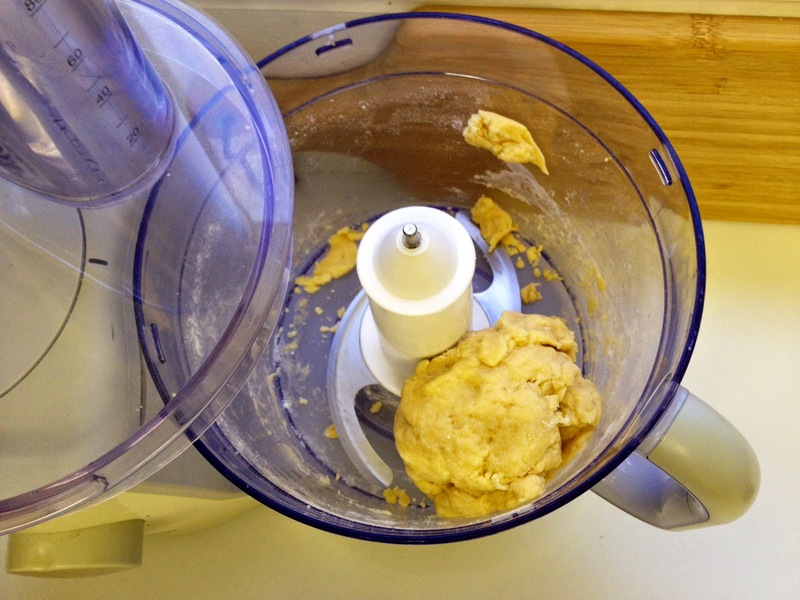 Once your dough has come together take it out of the processor and knead into a smooth ball. Let it rest for 30 minutes at room temperature but do ensure to cover it well in clingfilm as any exposed dough will harden and form a crust. To prepare the asparagus, cut off the tough ends, then cut the tips off and put them to the side. Then dice up the stalks, peppers and cut the tomatoes in half. 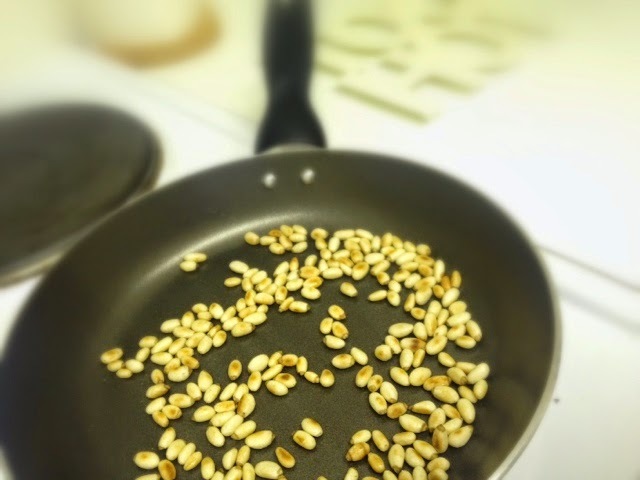 Once everything is prepared toast the pine nuts in a dry pan on a low - medium heat, stirring often until slightly golden, about 3 minutes. 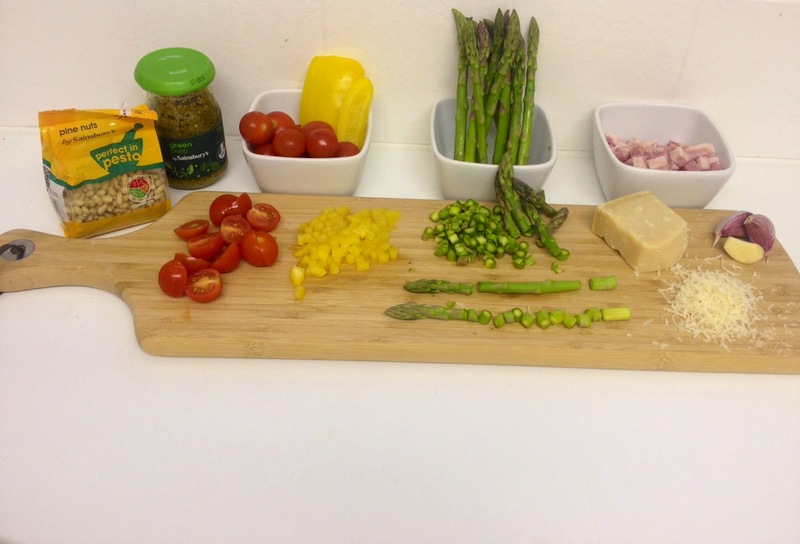 Then start by frying the pancetta, garlic, peppers and diced asparagus. 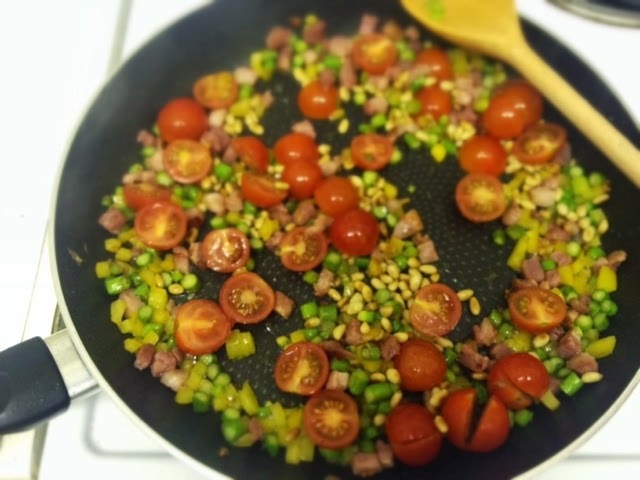 Only add the tomatoes and pine nuts in the last couple of minutes so the tomatoes don't become too mushy. Meanwhile you will need a pasta roller but if you don't have one you can use a rolling pin, however it may take a little longer and it will be harder to get an even thickness. I picked mine up from House of Fraser it was rather inexpensive at £22.50. First half the dough to make it easier to manage and dust your surface with a little of the '00' flour. Push the dough flat, make sure your roller is securely clamped to your work surface and set you roller to the widest setting. Roll the pasta through it 6-8 times, folding over the dough each time, this will help to work the dough creating a silky smooth finished pasta. 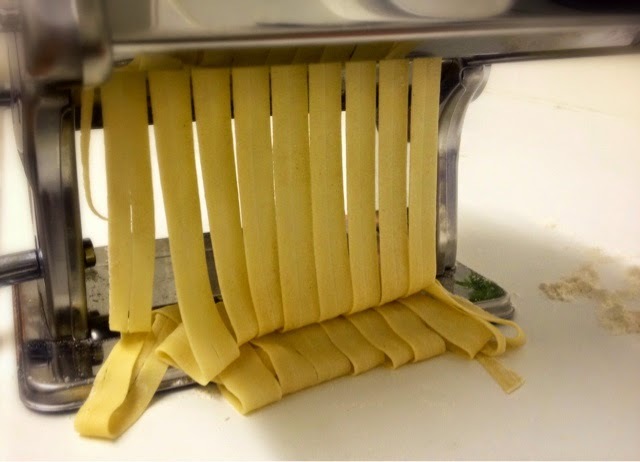 Then set it down to position 2 and roll the pasta through without folding, continue to change the settings decreasing the space between the rollers each time until you get the desired thickness, about 7 on my roller. Repeat with the other half of the dough. Add the cutting attachment and roll into tagliatelle. Put the pasta straight into salted boiling water as it will dry out if left too long. Add the asparagus tips you put aside earlier and boil until al dente. Drain the water and stir in a large spoon of pesto and lots and lots of cheese!!! Now plate up and ENJOY! I hope you liked this recipe and let me know in the comments your favourite pasta dish.